Watercolor Works: Lots More Art! I will be posting a new online lesson very soon. I have been very busy with shows, gallery openings, working on the final details of the upcoming DVD (Beginner's Watercolor Workshop - coming soon! 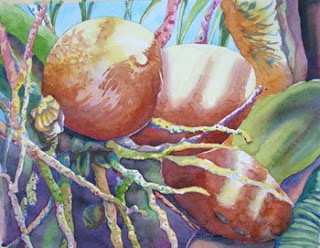 ), and painting with my friends from The Art & Antiques Studio Gallery. 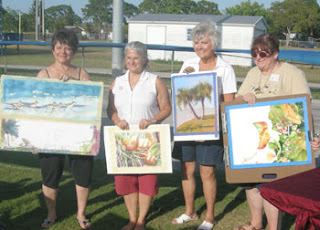 Lolly Walton, I, Barbara Smythers and Therese Ferguson (right), painted for the Relay For Life this past Saturday at the Eau Gallie High School. We worked on our paintings for about 4 hours, and then donated them. People attending the event were able to purchase tickets, then place their tickets in a jar, which was designated for each painting. At the end of the event tickets were drawn and winners were notified. At right are the coconuts I painted for the event. Most paintings take between 20 and 60 hours, so this was very fast for me! We had a wonderful time and the entire event (not just our paintings) raised $14,000 above their goal to help with cancer treatment and prevention. We were thrilled to be a part of it. We met many cancer survivors and enjoyed the sunny, very breezy, day!